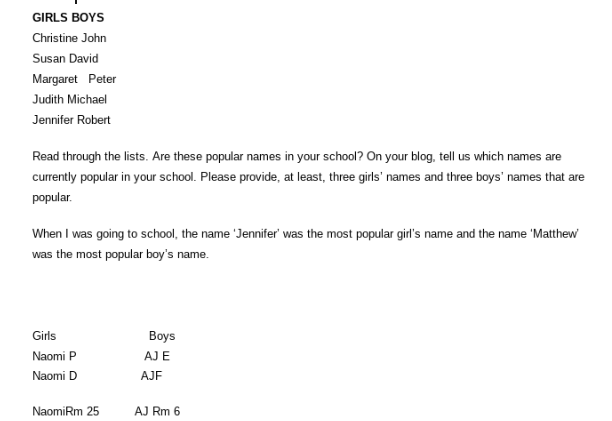 Hey there Hazel, thank you for completing another activity and sharing the most popular names at your school. I wonder if AJ stands for the same thing for both of these boys. Could it mean Aaron Junior? I certainly don't know any girls named Naomi. When I was in primary school, which was 15 years ago, there were a lot of girls named Jessica and Georgia. There were also a lot of boys named Thomas and James. These are still pretty popular names, I think. What name would you choose if you weren't Hazel? Although Hazel is a really nice name.